Dental implants are fixed replacement teeth which look, feel and function like natural teeth meaning you can eat and drink whatever you are used to and improving your quality of life in subtle ways. People who have felt embarrassed and worried because of their tooth problems are often amazed by what new permanent teeth can do for their self-esteem and confidence to smile. Dental implants are one of the most predictable ways to replace missing or un-savable teeth. They usually last far longer than bridges, crowns and dentures. Dental implants are the closest thing to your own teeth in how they look and feel. Though the initial cost is higher they usually need far less replacements. They do however require minor surgery to place the implants. 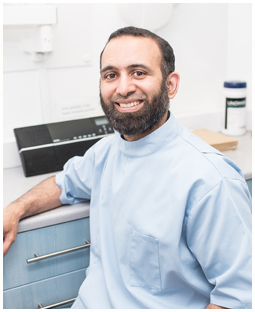 Dr Kashif Saeed has been placing implants at Abbey Dental Walthamstow since 2008. Dr Kashif Saeed obtained his diploma in restorative dentistry from FGDP(UK) Royal College Surgeons allowing him to treat and restore complex cases, including full mouth rehabilitation. Most people are suitable for dental implants. You need to have enough bone in the area that implant placement is planned. This will be assessed by Dr Saeed at your consultation appointment. Older Age is NOT a contraindication. Patients will need to be at least 18 Years old. Treatment times vary. Usually we will place the implant and provide a temporary tooth to replace the gap. Then the crown/ bridge/ denture will be placed 4 to 6 months later. For same day teeth, a full set of teeth is fixed in place on the implants and replaced with the final set 4 to 6 months later. What is the process for having dental implants? During your consultation with Dr Kashif Saeed you will given an individual treatment plan, an explanation of the process, likely timescale and costs. If it is determined that you are suitable, you will have the opportunity to consider the proposed treatment and make an appointment to return to have the implant placed. On the second appointment, if you have enough bone, the implant is placed and then given time for your body to fuse with it (Osseointegrate). You will return 4 to 6months later where the implant is uncovered and the final crown /bridge/denture fixed to the implant. If there is insufficient bone, artificial bone may need to be placed making the processes slightly longer. What results can I expected from my new dental impant? Implants offer a fixed replacement of teeth that do not damage or put pressure on your natural teeth. They are the closest replacement to your teeth in appearance and function. If looked after with good cleaning and annual reviews, they usually last much longer than crowns or bridges. How much do dental implants cost and are dental implant affordable? Our consultation fee is £70.00 which if you decide to go ahead with treatment, the fee is deducted from the price of the overall cost of the implant treatment. The costs are £1800 per implant. This includes the cost of the abutment and crown and review appointments for 1 year after treatment. We offer 0% finance with repayments to suit your needs. A member of our team will be happy to talk you though this. See Finance here.